The story of the Enterprise NX-01's journey into the Delphic Expanse will be the subject of an upcoming tie-in novelisation. The Expanse, currently scheduled for release as a hardcover in October, 2003, will be written by J.M. Dillard, Psi Phi reported. The book will be based on the Enterprise second-season finale, "The Expanse", and third-season premiere, "The Xindi", penned by executive producers Rick Berman and Brannon Braga. Enterprise's second-season finale left viewers hanging as the NX-01 entered the Delphic Expanse to track down the Xindi, a mysterious alien species which launched a devastating attack on Earth. 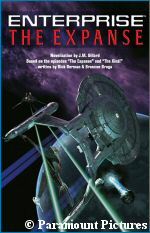 Since the season three premiere, "The Xindi", picks up six weeks after "The Expanse", Dillard's novelisation will include an original story which takes place in the intervening period. J.M. Dillard is a veteran Trek writer, whose credits include the novelisations of Star Trek Nemesis and Star Trek: First Contact. Dillard also penned the original Enterprise novel, Surak's Soul. To pre-order the The Expanse and support TrekToday, please use the following links: Amazon.com (30% off) - Amazon.ca (15% off) - Amazon.co.uk (10% off) - Amazon.de. The original report, as well as a larger version of the above cover art, can be found here at the Psi Phi Star Trek Books Database.